I was down in Oakland on Friday for another screening of 'Paddle California' and figured I would stay over and get some paddling in on the Bay. A couple folks reminded me that Saturday was the annual Gonzo paddle of the Bay Area Sea Kayakers. 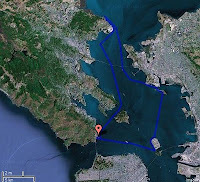 The idea is to visit as many islands in the San Francisco Bay as possible in one day. The current route hits 14 islands, covers 37 miles and took about 7.5 hours. 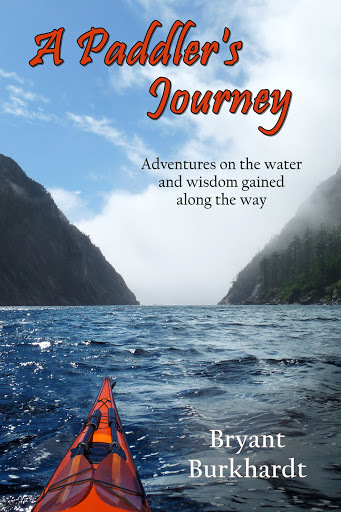 The day is chosen to get as much assist from tidal currents as possible, but with all the little detours to islands it is hardly a free ride. 21 kayakers launched from Horseshoe Cove under the Golden Gate Bridge at 7am (actually a couple were a little late and had to catch up to the group). By the time we got to the first island, Alcatraz, we were already spread out across the Bay. To cover such a distance with a large group of folks in a variety of boats it's impossible (and not necessary) to stay tight. So the group broke into smaller pods based on speed and who you most wanted to talk to. We all regrouped at China Camp for lunch where a number of folks joined the fun for a one-way paddle down to Horseshoe Cove. By this point we had covered the majority of the distance (23 miles) and islands (only 3 left). The afternoon went fairly quickly with a strong current at our backs for most of the way. The final homestretch through Raccoon Strait had a bit of a headwind that made the paddling seem hard - but if you looked off to the side you realized the current still had you mo ving at 4+ knots. After a short stop to play in the tide rip at Yellow Bluff it was back to the beach with some lovely chocolate chip cookies waiting at the finish line. And after loading the boats and cleaning up it was in to the yacht club for a beer and burgers and the immediate recounting (and embellishing) of a very successful day on the water. On a separate note, my first screening for Paddle California is tonight in Sacramento. It's going to be interesting to get reactions from the public - though most of the folks at this event are going to be friends so I'm expecting an easy crowd. When I hit the road and head up to Washington I think I will get a more critical audience. The DVD's are here in hand (and available for ordering) and I've got some screenings scheduled and am working on more. The world premier of Paddle California will be at California Canoe & Kayak in Sacramento on Friday, Jan. 22 @ 7pm. Then I have a showing down in Half Moon Bay on the 24th and at CCK Oakland on the 29th. After that I head to the Pacific Northwest for some screenings (and paddling) before coming back home for the Golden Gate Sea Kayak Symposium. Then hopefully down to SoCal for some more shows and then several ACA courses in March. Looks like the year is filling up quickly. I am very happy with how the DVD turned out and I'm really excited to share it with everyone. I'm expecting lots of friends who I know will be supportive (as they have been for the whole project) but I'm really curious as to how the general public will take to my little project. I have seen the footage so many times in editing that I no longer have a good perspective on what people will think seeing it for the first time. The response to the trailer (see below) has been good and I think it's a fairly accurate representation of the video as a whole. Oh - I also got in a little paddling before the never ending series of storms starts tomorrow. Yesterday I dusted off my polo boat for a workout on the lake and today I hit Folsom Lake with a couple friends. Isn't that what's so great about boating - river, lake, ocean, flatwater, class V, exercise, relaxation - it's all good. As I finished loading up and got in my truck to head to the river I realized in my rush I forgot my camera. But instead of running back inside to grab it I decided to leave it at home and just enjoy a day of boating with friends. As much as I've enjoyed documenting my paddling this past year sometimes it's easier to just paddle. And so that is what I did and what a wonderful day it was. Three good friends, a sunny Cali winter day and miles of class V goodness on the S Yuba - this is what whitewater paddling is all about. I ate the meat on 'Eat the Meat'; got sent spinning on 'Around the World' and boofed the hell out of Ski Jump. I was worn out at the end of the day and clearly need to work on my fitness. I started out really rusty and had some sketchy lines (though some really nice ones too). El Nino is kicking in and the winter boating season has officially been kicked off! So I've finished the editing and sent the master off for duplication. 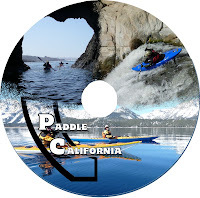 Paddle California the DVD is a reality. The video contains over an hour of paddling featuring some of the best locations in the state: Mendocino, Middle Feather, Kern, Channel Island, Lake Tahoe and the US Kayak Polo National Championships. The focus is on the beauty of our state and the places that paddling can take us. I'm in the process of setting up screenings at various locations throughout the state - the first will be at CCK in Sacramento on Friday, Jan. 22. I'll post a complete list when I get more dates nailed down. I've been slaving away trying to finish off the Paddle California DVD (more details soon) and have been stuck at my desk for days. I really needed to get out on the water so when my buddy Matt suggested a short day on Chili Bar (SF American) I jumped at the chance. It would also give me a chance to try out the 2010 Jackson Fun which CCK just got in to the shop. It was a nice mellow day on the river and I was really happy with the boat. For the past several years I've only had a creek boat and I've been thinking of adding a little river runner/playboat as is the standard these days. But most playboats are just too specialized and clumsy paddling downriver. So I was happy to see that the new Fun, even though it looks like the old AllStar, actually worked quite well. I didn't play too hard but it clearly can handle that aspect as well. Maybe I'll pick one up for myself this spring.